Never miss a great Forever 21 coupon and get our best coupons every week! Sign up for the Forever 21 credit card and get rewards! Use in-store or online, and receive 20% off your first purchase. Click now for full details. Students, rejoice! Not only are you getting smarter, but you're saving! 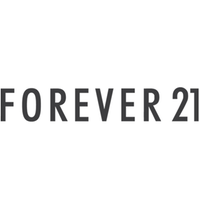 Click here to get Forever 21's student discount and save 10% instantly. Up to 50% off right now! That's what this Forever 21 coupon gets you, right now, when you click it and lock it in! Happy shopping! 20% Off: Tops & Bottoms Sale! Mix and match girls' tops and bottom and get 20% off! Shop the sale now. Forever 21 has some truly amazing sales coming up. Click here to keep up with all the savings. Are you ready for Spring Break? Pick up last minute items like swimsuit cover ups, bathing suits, bikinis, swim totes, and more for 30% off. It doesn't seem real, does it? $1 deals? Well click through and check it out! Shop activewear and workout gear at Forever 21! Items include sports bras, capris, pants, hoodies, tops, and more. Give your athletic look some style today! Limited time only! Shop this deal on select styles from Forever 21. No code needed! Get ready for spring break with Forever 21's great selection of season-perfect spring duds for just $10! Tis the season! Use this coupon and get access to Forever 21's gorgeous summer dresses for under $20! You don't even need a promo code. Just click through to lock in the discount. Happy summering! Can you guess how many items Forever 21 has for $5 or less? (Hint: over 500.) Give up? Over 500! I know, it's crazy. Click through and shop apparel, gifts, accessories, beauty essentials, and more, all for 5 bucks or less. The floor is yours, Forever 21 shopper! You don't have to break the bank to be your own fashionista. Check out these amazing prices and discounts at Forever 21, starting at $1.90! No promo codes needed, deals updated daily. Check this page for all the latest trends and sales for Forever 21's plus-sized styles! Discounts updated daily. No promo codes needed. Take a look before they're gone! Makeup, primers, beauty tools, accessories, and more are under $5 ONLY at Forever 21! Shop now. Created for people of all shapes and sizes around the world, Forever 21 is an affordable fashion retailer, striving to help women, men, and kids stay on-trend with their wardrobe choices. Not afraid of discounts, Forever 21 has become famous for their low prices and frequent flash sales. While some global fashion empires turn their backs on slashing prices, Forever 21 has fully embraced this form of marketing and is the leader in affordable fashion. From swimsuits to puffy coats, they offer styles for every season and occasion and have recently even introduced a line of bridesmaid dresses. And with Forever 21 coupon codes, coupons, and promo codes, you'll be able to save even more in 2018. Saving money at Forever 21 is simple, and there are lots of ways to do it. First, you can sign up for emails from Forever 21 which will include an initial promo code PLUS loads more in the future. You'll also get access to sitewide and invite-only sales and events. Another way, and the best way, to save money is to be sure to scroll through the Groupons Coupon page for Forever 21 every time you shop. We work full-time to get you access to the best deals online! If you're entering a promo code on the Forever 21 website, you'll add partway through your order checkout. Once you have your order total and are about to finalize, look for the promotional code entry to put in your code and save more. This will be before you enter your payment information. Is There a Forever 21 Promo Code for Free Shipping? There usually is! Check out the Forever 21 coupons on this page and you'll see it if it's there. Just apply it to your order when you're at the end of checkout, and save big with free shipping! What is Forever 21's Return Policy? All online purchases made on Forever21.com are eligible for exchange, credit, or refund within 30 days of the ship date. The packing slip you got with your order will have a postmarked date that specifies the final day you have to return your stuff by mail or directly to one of their stores.